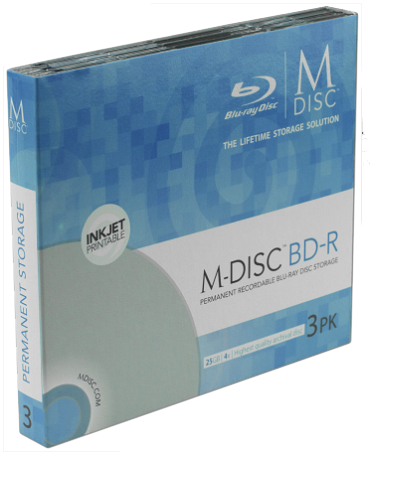 Save your video library and other important digital images and documents to Blu-ray Disc. Digital files backed up to Blu-ray Disc. The minimum order is $25, the equivalent of backing up 25GB. Estimate the number of GB to place on a Blu-ray Disc, and enter this number in the Quantity Box. We will consolidate the transfer of digital files to the fewest number of discs needed. Organization of files will be done according to customer instruction. If the number of GBs is greater than your estimate, we will contact you with the total number of GBs and wait for your instructions before finishing the project. We do not collect your money until your job is complete and ready for return shipment. We can receive your digital content via web file transfer or UPS package shipment. If you prefer to send us your files via the web, we will send you a link to an online Cintrex AV account into which you can upload your data files and instructions. We will also accommodate other forms for file transfer, accommodating your preferred transfer method. After order submittal and payment, you will also receive a link to a UPS label generator if you want to mail a package into Cintrex with original content. UPS shipping both ways is free on orders valued at $100 or more. The UPS shipping & handling charge is $10 on orders of $50 or more, and S&H is $25 on orders less than $50 in value. Organization of content, and labeling the disc - Cintrex will follow your direction for file organization and labeling the Blu-ray Disc. Please include your instructions in the comments field, or with additional notes in the UPS package or file uploads. Blu-ray Disc versions include Blu-ray M-DISC (rated to retain information up to 1,000 years), Dual Layer (DL) Blu-ray M-DISC (50GB storage), and triple layer 100 GB discs. An overview of the Blu-ray M-DISC below. 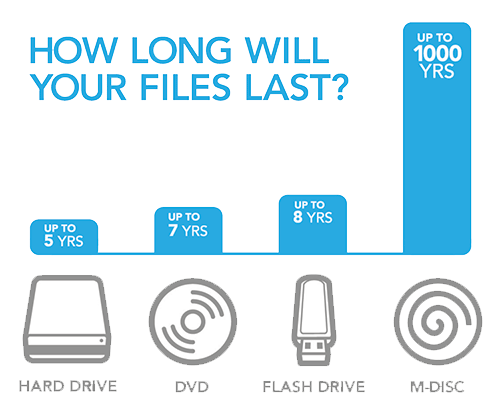 Store digital content without data loss for decades up to 1,000 years. Available in single layer 25GB and dual layer 50GB storage capacities.. Tested - The Naval Air Warfare Center at China Lake declared the M-DISC as top rated optical disc after testing the M-DISC against the best conventional archival discs on the market. Long Lasting - utilizes chemically stable and heat-resistant materials not used in any other Blu-ray or optical disc for greater longevity. Stability - cannot be overwritten, erased, or corrupted by natural processes unlike competing archival media. Durable - resistant to damage caused to typical optical media from extreme temperatures, humidity and sunlight.